Most people love cheesecake, but often steer away from making it because they think it is impossible to come out with the perfect dessert. Trust me, it is actually very easy – and with just a few tricks, you can have a smooth top cheesecake that everyone will enjoy! 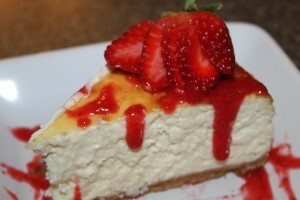 This easy to follow recipe can be prepared ahead of time, making for a labor free dessert for the night of your choice. I typically make this a day or two before our Valentine’s Day Dinner – which we usually make together at home. However, even if you enjoy a nice dinner out on this special occasion, you can surprise your loved one with this decadent dessert upon your return home! We have also included how to make a quick strawberry sauce to drizzle over the top of this, or any, treat. And yes, we even used the frozen strawberries from our summer crop. 1. Prepare the crust: Spray the bottom of a 10-inch springform pan with cooking spray; line the bottom with a round of parchment paper; and spray the paper with cooking spray. Place the entire spring form pan on a sheet of heavy-duty aluminum foil and bring the foil up around the sides to enclose the seam between the bottom and the sides of the pan. This will help prevent water from leaking into the bottom of the pan when the cheesecake is baking. 2. Stir together the graham cracker crumbs and sugar in a mixing bowl. Add the melted butter and mix until the crumbs are coated. Press the mixture firmly into the bottom of the pan and partially up the sides. Set aside. 3. For the filling: In a stand mixer, beat the room temperature cream cheese together with the sour cream. Add the eggs, one at a time, beating well after each addition. Add the sugar, cornstarch and vanilla, and beat until smooth. Scrape down the sides periodically to ensure the mixture is smooth. 4. Pour the filling into the prepared crust. Set the foil-wrapped pan inside a larger pan, and carefully pour 1/2 inch of warm water into the larger pan to create a water bath. Bake for 1 hour. 5. After baking for an hour turn off the oven, open the oven door and let the cheesecake stand in the opened oven for 1 hour. 6. Remove the foil and refrigerate the cheesecake for at least 2 hours before removing it from the pan. You can let it set up overnight if desired. 7. To make the strawberry sauce: Place the strawberries, sugar and lime zest in a food processor or blender until smooth. Chill for at least 1 hour before serving. Drizzle over cheesecake. ← Winter Photos From The Farm – And The Snow Falls!